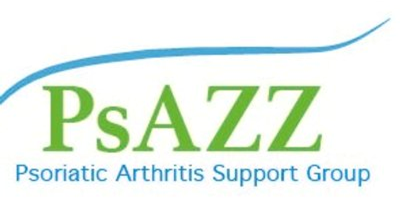 PsAZZ is a self-supporting, volunteer-led group for people with psoriatic arthritis (PsA) that was formed in 2011 by a small group of patients from Bath. PsA is an inflammatory arthritis associated with the skin condition psoriasis, and can cause joint pain, stiffness, deterioration, and 'enthesitis' which is inflammation of the tendons, muscles or ligaments. Many people who have psoriasis are not aware that they are at risk of developing it. Each year since we started, PsAZZ has run eye-catching, creative 'awareness campaigns' from woolly yarn-storms to photo mosaics. As our Chair, Mel Brooke, says: 'Our campaigns are aimed at helping to raise awareness of both the disease and the support group so that others can join us, make friends and have a place to share their experiences…people often have questions or concerns outside of a clinic appointment or feel they want to talk to someone who knows what they are going through and how they are feeling - which can be a huge comfort especially after diagnosis when people are wondering what their life will look like in future. Having access to the group means they can connect with other people who understand and, as well as the moral support, we always do our best to help find them answers or point them in the right direction"
Since it began, PsAZZ has continued to grow and we now have members from all walks of life, all ages and from many different areas. When they can, they get together for informal catch-ups but also have a website and are on social media (Twitter, Facebook, Pinterest) which is great for those people who can't get out easily! PsAZZ are always happy to welcome new members - to find out more visit our website or simply get in touch by emailing psazzgroup@gmail.com . 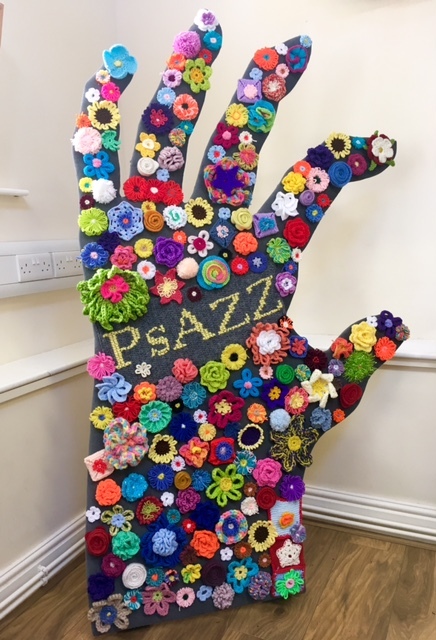 As part of their 2016 PsAZZ creative awareness campaign, the group created a giant crochet hand, which is currently residing in the foyer of the Royal National Hospital for Rheumatic Diseases.